Unit 8 单元测试题Ⅳ. 单项选择(每小题 1 分， 共 10 分)从 A、B、C 、 D 四个选项中选择可以填入空白处的最佳答案。( )16. We have ______ school trip ______ this week. 21 教育名师原创作品A. a; 不填 B. an; at C. a; at D. an; 不填 ( )17. The New Year party is ______ the evening of January 1st. A. in B. on C. at D. of ( )18. Linda’s grandpa is very ______. He is ninety this year. 21*cnjy*comA. long B. tidy C. fat D. old ( )19. ______ is the 10th month of the year. A. April B. July C. August D. October ( )20. Three of my friends will have their birthday ______ next month. A. parties B. games C. cards D. schools ( )21. ______ school ID cards are on the desk. A. Mike and Tom’s B. Mike and Tom C. Mike’s and Tom D. Mike’s and Tom’s ( )22. Today is my cousin’s ______ birthday. She is ______ now. A. fifteen; fifteenth B. fifteen; fifteen C. fifteenth; fifteen D. fifteenth; fifteenth 21cnjy.com( )23. —Is your birthday on October 12th? —______, it’s on ______. A. Yes; the 13th B. Yes; the 13 C. No; the 13th D. No; the 13 ( )24. —______ is your great sale? —Next week. A. What B. When C. How D. Where ( )25. —Happy birthday to you, Susan.—______.A. Thank you B. I’m thirteen C. I’m fine, thanks D. You’re welcomeⅤ. 完形填空(每小题 1 分，共 10 分)先通读下面的短文，掌握其大意，然后从 A、B、 C、D 四个选项中选择可以填入空白处的最佳答案。易读度 ★★ Next week my family will go to Hong Kong and Macau. I’m very 26 . First, I need to buy a big 27 . I want to take some clothes, 28 shoes and some books. I’ll put (放) all the things in my bag. Second, I need 29 of Hong Kong and Macau. I want to go to many attractions (景点) there. With maps, I can easily know 30 they are. Third, I need to 31 tickets (票). We’ll go to Hong Kong first by plane. I need 32 tickets for my parents, my sister and I. Next, we’ll go to 33 from Hong Kong by ship. Our trip is not very 34 , but I think we’ll have happy days 35 Hong Kong and Macau. 21·世纪*教育网( )26. A. happy B. tidy C. fine D. interesting ( )27. A. jacket B. clock C. bag D. hat( )28. A. a pair B. pair C. pair of D. a pair of ( )29. A. CDs B. books C. maps D. tapes ( )30. A. where B. what C. when D. how ( )31. A. find B. know C. buy D. see ( )32. A. three B. four C. five D. six ( )33. A. Hong Kong B. Macau C. Beijing D. Guangzhou ( )34. A. small B. big C. short D. long ( )35. A. to B. in C. on D. for Ⅵ. 阅读理解(每小题 2 分，共 20 分) A易读度 ★ My sister Mary is 12 years old. Her birthday is on November 10th. Every year, on the morning of that day, my parents take us to Zig Zag’s Clothes Store. There my mother buys some clothes for Mary. Then we go to Huaxing Bookstore. There I buy some CDs for Mary, and my father buys a book for her. 2·1·c·n·j·yIn the afternoon my parents have a birthday party for Mary at home. Mary’s friends Bill, Jim and Cindy come to the party. Bill brings some pens for Mary. Jim gives Mary some balls because (因为) she likes playing with them. Cindy gives Mary a cake. Mary is very happy. Oh, I’m Mary’s brother. My name is Nick. 根据材料内容选择最佳答案。( )36. Mary is ______ years old.A. ten B. eleven C. twelve D. thirteen( )37. ______ buys clothes for Mary.A. Mary’s father B. Mary’s mother C. Nick D. Bill( )38. Jim and Bill are Mary’s ______.A. brothers B. uncles C. cousins D. friends( )39. Cindy gives ______ to Mary.A. a book B. some balls C. a cake D. some pens ( )40. 下列哪项陈述是正确的？A. Mary is Nick’s classmate. B. Mary has a good time at the party.C. Mary doesn’t like to play with balls.D. Mary can get a notebook on her birthday. B易读度 ★★ Tim: Nice to meet you, Jessica. Jessica: Nice to meet you, too, Tim.Tim: Are you from Japan (日本), Jessica?Jessica: No, I’m from China. But I am here, in the USA, with my family now.Tim: Oh, my mother is Chinese — from Beijing! Are you from Beijing?Jessica: No, we’re not from Beijing. We are from Chongqing.www.21-cn-jy.comTim: One of our teachers is from China, too. There he is — the man in a blue shirt.Jessica: Oh, I know that man! He is my father! He likes blue very much.Tim: Can you speak (讲) Chinese?Jessica: Yes, I can.Tim: How old are you?Jessica: I’m thirteen. Tim: Oh, we are the same age. I’m thirteen, too. 根据材料内容选择最佳答案。( )41. Tim may be (可能是) Jessica’s ______.A. brother B. cousin C. classmate D. teacher( )42. ______ is a teacher.A. Jessica’s mother B. Tim’s motherC. Jessica’s father D. Tim’s father( )43. 划线单词 “age”的中文意思是“______”。A. 学历 B. 年龄 C. 身高 D. 爱好( )44. Jessica ______.A. is from Japan B. studies in China C. likes blue very much D. can speak English and Chinese( )45. 下列哪项陈述是正确的？A. Jessica’s father is in the USA now. B. Tim is older than (比……更大) Jessica.C. Tim’s mother is from Chongqing, China.D. Jessica doesn’t know the man in a blue shirt.Ⅶ. 补全对话(每小题 2 分，共 10 分)根据对话内容在空白处填入适当的句子，使对话完整、通顺。A: Hi, Jill! B: Hi, Grace! Is the boy your friend? A: (46)_______________. He is my friend Tim. Tim, this is my friend Jill.B: (47)_______________. C: Nice to meet you, too, Jill. B: Tim, (48)_______________? C: I’m thirteen. B: Oh, I’m thirteen, too. C: (49)_______________? B: It’s on July 2nd. What about yours? C: (50)_______________. B: Really? That’s great. We can have our birthday party together (一起) this year. C: Sounds interesting. Ⅷ. 词汇运用(每小题 1 分，共 10 分)A)根据句意及所给首字母提示，补全句中所缺单词。 51. Women’s Day is in M . 52. I want to go to Xi’an for a t . 21 教育网53. 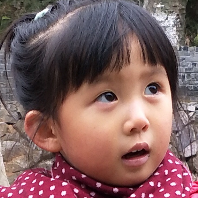 Lily will sing (演唱) at the school music f . www-2-1-cnjy-com54. My father is very b every day. He often comes home late. 55. Do you have t to go to the library with me? 2-1-c-n-j-yB)根据句意及所给汉语提示，写出句中所缺单词。56. Bob’s home is on the ________(第二十一) floor. 57. We have two ________(美术) classes every week. 58. Lisa always has some interesting ________(事情) to do. 【来源：21·世纪·教育·网】59. These ________(学生) go to school at 7:30 every morning. 【来源：21cnj*y.co*m 】60. How do I go ________(那里)? Ⅸ. 完成句子(每小题 1 分，共 10 分)A)根据括号内的要求完成下列各题，每空一词(含缩略形式 )。 61. Do you have a baseball game? (作肯定回答)________, we ________. 62. Is your English test in June? (补全答语)No, ________ ________.63. We have a book sale this month. (改为否定句)We ________ ________ a book sale this month.64. I have breakfast at 7:40. (对划线部分提问)________ ________ you have breakfast? 65. Peter’s brother is 15. (对划线部分提问)________ ________ is Peter’s brother?B)根据汉语意思完成英语句子，每空一词。 66. 艾伦，我有一些好书给你。Alan, I ________ some good books ________ you. 67. 我们的学校开放日是在 6 月 20 日。Our School Day ________ ________ June 20th. 68. 祝你过得愉快!Have a(n) ________ ________! 69. 你今天下午可以来我们服装店。 You can ________ ________ our clothes store this afternoon.21 世纪教育网版权所有70. 今天晚上 7 点见。________ you ________ 7:00 this evening. Ⅹ. 书面表达(10 分) 假如你叫王琳，是第二中学的一名学生。请你根据表格提示用英语写一篇60 词左右的短文，简单介绍你的学校以及学校活动等情况。开头已给出，不计入总词数。 21·cn·jy·com第二中学学生人数 约 1200 人3 月 英语演讲比赛(speech contest)5 月 校外活动10 月 球类比赛学校活动12 月 新年晚会I’m Wang Lin. I’m a student in No. 2 Middle School. _______________________________________________________________________________________________________________________________________________________________________________________________________________________________________________________________ 参考答案Ⅳ. 16-20 ABDDA 21-25 DCCBAⅤ. 26-30 ACDCA 31-35 CBBDBⅥ. 36-40 CBDCB 41-45 CCBDAⅦ. 46. Yes, he is47. Nice to meet you, Tim48. how old are you49. When is your birthday50. My birthday is on July 2nd, too Ⅷ. 51. March 52. trip 53. festival 54. busy 21*cnjy*com55. time 56. twenty-first 57. art 58. things 59. students 60. thereⅨ. 61. Yes; do 62. it isn’t 63. don’t have 64. When do 65. How old 66. have; for 67. is on 68. good time 69. come to 70. See; at【出处：21 教育名师】Ⅹ. One possible version:I’m Wang Lin. I’m a student in No. 2 Middle School. We have about 1,200 students in our school. Every year, we have some interesting and fun school activities. In March, we have an English speech contest. In May, we have a school trip. In October, we have some ball games. I like sports, and October is my favorite month. In December, we have a New Year party.